WoooOooohWhooo. You hear that freaky music? That's the cue that you're about to get attacked by a monster. Oh no! What a fright! Of course, it doesn't have to be all frightening. Not in the bit! Because it's Halloween, and you're turning your home into a macabre lair of darkness. And when that's the sort of Halloween fun that's destined for your abode, there is a certain monster that we feel needs to be called upon. The Lagoon dweller who's known simply as the Gil Freak! Now that would be a frightening addition to your theme indeed! Well, we've got an easy way to include him and his likeness in on the fun. Just get this Gil Freak Vacuform Wall Hanger Décor! 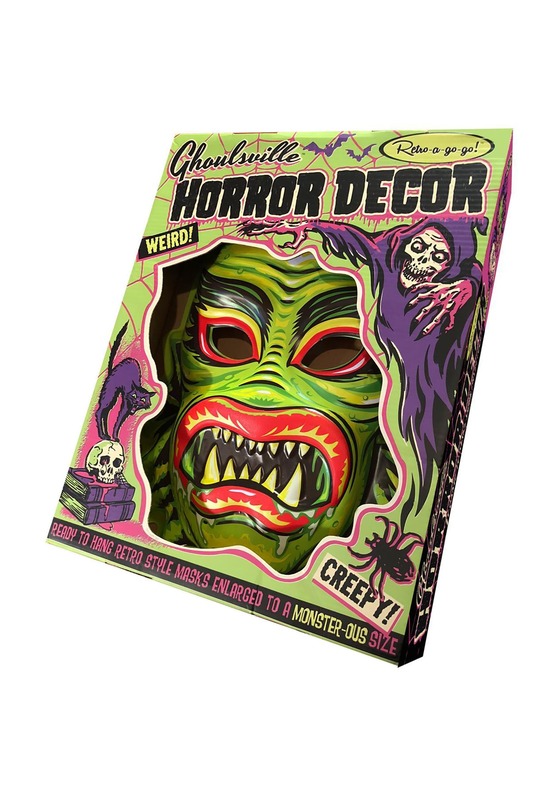 Styled like a classic Halloween costume mask from the 70s and 80s, this mask is designed to be hung up on the wall, and it's slightly oversized for added visual appeal. It measures about 23 inches tall and is painted in vivid colors. You'll have a piece of memorabilia that's instantly evocative of black and white horror films when you get Gil Freak Vacuform Wall Mask. Get it to hang up this year, and check out all of our other décor to complete your spooky decorating theme!